Upon graduating for High School in Peterborough in 1961, I packed my bags, said good by to five brothers and sisters and headed off to St. Peter's Seminary in London. Finding myself conflicted by the sterile seminary life and the rich exciting life offered (apparently) to the rest of students of the University of Western Ontario, many of us were looking for outside challenges. I found just such a rewarding challenge in the mid-sixties when I and several friends from the seminary, encountered the idealistic CIASP organization and its London chapter. After spending many months learning Spanish, learning about Mexican culture and social customs we embarked in 1966 to spend our months in Mexico. I found myself, literally, in the small rancho of Amolar, 18 miles outside Pisa Flores. I came to know on a very personal basis, my two colleagues Nicole Larivee from Montreal and Bob Plumb from London. I would dearly love to learn where Nicole and Bob are now and to have an opportunity to speak with them for old times sake. In retrospect, I doubt that we had very much influence in the lives of our friends in Amolar. We spent our days teaching reading, writing and math (in Spanish) and exchanging ideas with some of the villagers. I often think back upon the Viveros family, six brothers who were intelligent, ambitious but dirt poor. This family became my very special friends because of common interests and because of their magnetic openness to us, I wrote several letters to Leoncio Viveros upon returning to Canada but never heard back from him. I guess that in itself is a statement about the impact our sojourn had on residents of Amolar. Back in Canada, I was ordained to the priesthood in 1968 and spent 10 years in that profession in Peterborough Diocese. In 1978, my goals and aspirations changed diametrically, and I sought and found a great and new career. My new career brought me to North Bay to work with the Ministry of Community and Social Services. Over the years, I worked in a range of capacities, with most time being spent as Manager of Systems and Planning, and then Program Supervisor, in the Northeast Area of Ontario. I met my wife Marilyn in 1980, we married in 1981 and have two wonderful daughters, Colleen and Kelly. Both girls are still in University,, one at Queens and the other at Carleton, so Marilyn and I frequently find ourselves in either Ottawa or Kingston. I have been fortunate to maintain life long friendships with Ron Prieur, Mel MacIsaac, Ray Mahoney and Rene David, all former CIASPers. We have frequently reminisced about our times in Mexico 40 years ago. We learned that others are reminiscing like us, particularly Jim Creechan and John Vella. Together, we wish to pursue the common goal of arranging for a modest reunion of former CIASPers, sometime in the year of 2006. We all have particular memories and particular persons we would like to rediscover. Among those people, for me, are the afore-mentioned Nicole Larivee, as well as Ginette Gagnon, both of Montreal. I look forward to renewing acquaintances with old friends in the summer of 2006. To illustrate how the years change us, below is a picture of me, now, taken at a train station in south west Germany, where Marilyn and I had a fabulous cycling trip this summer. 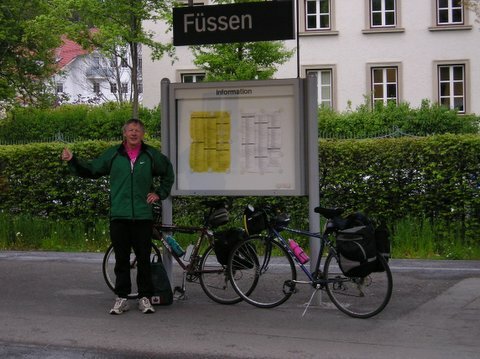 A picture of me, taken in June 2005 in a train station in southern Germany - Marilyn, my wife and I took a long cycling trip through Germany Switzerland etc. and this was taken on a very difficult rainy day.